Universal app a first for developer Kairosoft. Great news for Kairosoft fans this morning. Not only has the prolific studio released its all-new management sim Cafeteria Nipponica on the App Store, it's also the developer's first universal app, offering iPad gamers a slightly shinier than usual experience. 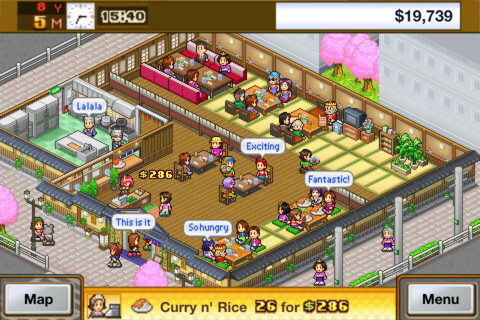 Cafeteria Nipponica is, as the name suggests, a restaurant management sim from the people who brought the mobile gaming world Game Dev Story, Hot Spring Story and many, many other titles in the same vein.